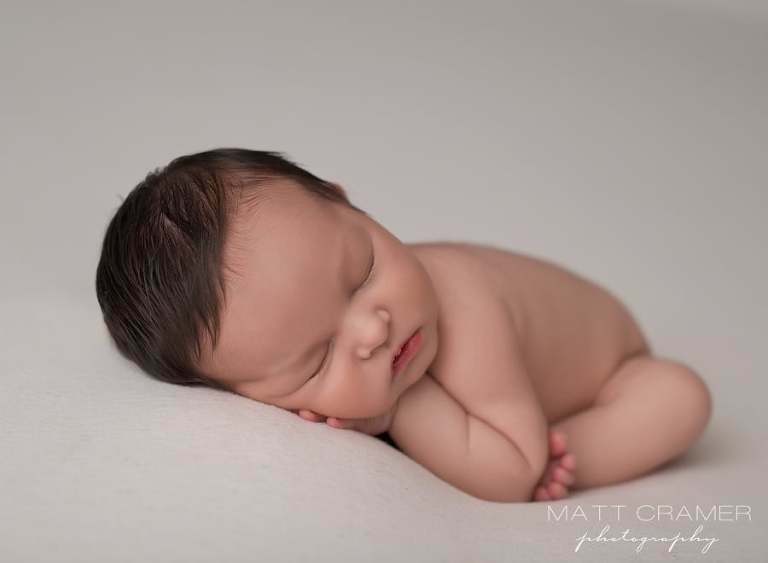 Meet sweet Baby M, who is not only gorgeous with all that dark hair but he is also sweet as they come. 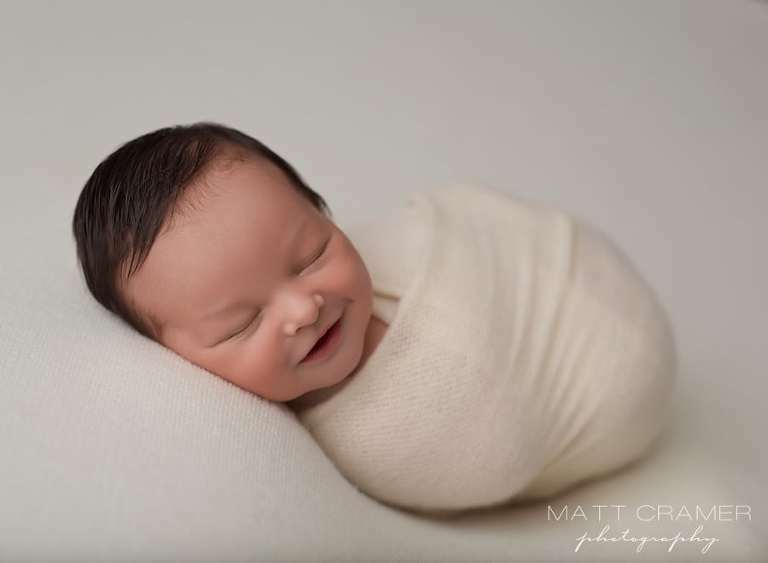 A dream baby in newborn photography world! He slept so peacefully through his entire photo shoot with us. As part of our pre-session preparation, we ask parents for their color, prop and posing preferences. Mom let me know that she really preferred lots of natural, bare baby posing, with minimal props. Her color preferences leaned towards softer shades of blues and creams. Additionally, she was hoping for more emotional parent photos with baby versus posed; which is totally our style. Because baby slept so well, we were able to breeze through our newborn photo session workflow easily. Starting with bare baby poses with clean fabric only, we played with different wraps, hats and accessories. We caught this insane adorable smile- perfection! Upon arrival, Baby M wasn’t quite into a really deep sleep yet. Many parents worry about this. What if my baby doesn’t sleep well during the newborn photography session? Well, we always go with the flow, and either capture some awake shots or swaddle them up and they usually fall asleep soon after. This swaddle wrap is one of my absolute favorites! It is actually a cashmere scarf from Banana Republic, and I call it my miracle swaddle. No baby can resist the extra soft fabric! Can you stand the cuteness?! Wearing one of my favorite sleepy hats from Baby Le Cradle and snuggling up to an adorable Minnie teddy bear from Just Peri, he is ready for serious sleepy time! Switching to a peaceful blue grey fabric, we gently transitioned baby into a variety of different poses. Keeping in mind that mommy preferred more natural, simple and clean looks. This fabric from Freebird Prop Shoppe is divine. That little bottom lip and all that hair! Matt is partial to aerial shots, and captures them in every session. He feels that it gives you a sense of just how small baby is. For sure, this is something all parents want to remember. After the fabric shots, we moved to the one prop we used: our beautiful vintage bowl. This prop is a client favorite. Pairing nicely with our grey blue fabric wrap and matching knit layer, I love the way this look came out. Another one of my favorite shots from this Los Angeles newborn photography session. I love his little hand on his knee, and he just looks so peaceful. Additionally, we wanted to add in an all cream look too! Mom and Dad were joking that this was his “Jon Snow” look- lots of fur and his jet black hair. Finally, we captured parent shots. Mom and Dad looking so in love with their new baby boy. This Los Angeles infant session was exactly what we wanted and felt incredibly full artistically! We are also proud to say that this Los Angeles newborn photography session was chosen to be featured on Beauty and Lifestyle Mommy magazine! 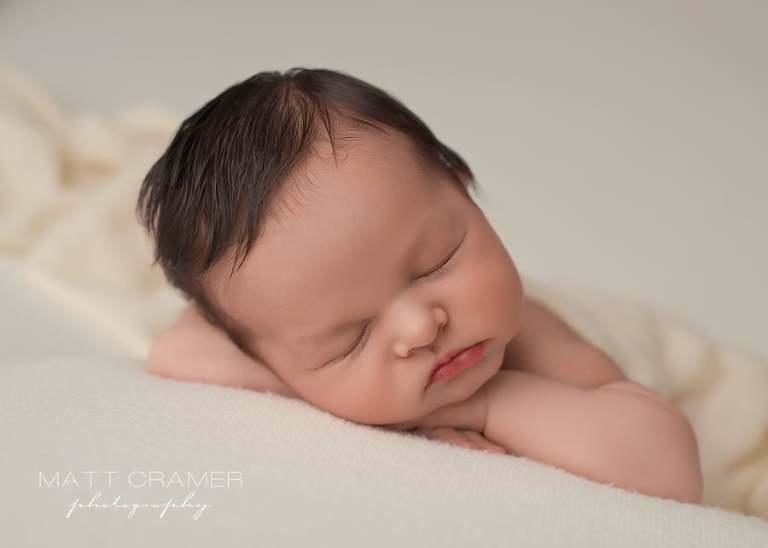 Matt Cramer Photography is a husband and wife professional Los Angeles California newborn photography team. They specialize in newborn, baby and cake smash photography in Los Angeles and surrounding Southern California areas including but not limited to Studio City, Burbank, Glendale, Sherman Oaks, Pasadena, La Canada, Encino, Beverly Hills, Malibu, Altadena, Santa Monica, Santa Clarita, Manhattan Beach, Hermosa Beach, Redondo Beach, Ventura County and Orange County. Matt Cramer and his wife Jessica are proud to be Newborn Photographers Los Angeles.